Citing people familiar with the ongoing talks, The New York Times reports Netflix is offering to pay Obama and his wife Michelle to produce exclusive content that would air on the streaming service. A deal has not been finalized and sources claim executives from Apple and Amazon also expressed interest in securing Obama's proposed content. It is not clear what form Obama's show will take if and when negotiations are complete. The former president has expressed concerns about supposed manipulation of the media by conservative news outlets, and has spoken publicly about the dissemination of false information through social networking platforms. 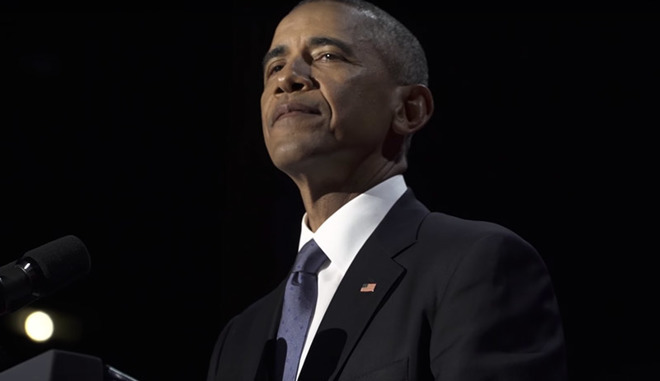 Despite the plinth Netflix, or other streaming platforms, presents Obama, his proposed show is not expected to be a direct rebuttal to political opponents, the report said. Instead, the program could see Obama moderate discussions on hot button topics like health care, voting rights, immigration, foreign policy and climate change. Other ideas include a feature in which the former first lady talks about issues like healthy nutrition, a cause for which she advocated during her time in the White House. Alternatively, the Obamas could endorse documentaries or fictional shows. The report goes on to note Obama's close ties with Netflix executives. Ted Sarandos, Netflix's chief content officer, is married to Nicole A. Avant, who served as Obama's ambassador to the Bahamas from 2009 to 2011. Netflix CEO Reed Hastings was close to Obama during his presidency and sometimes attended state dinners, the report said. Netflix, Apple, Amazon, Hulu and others are looking to build out their respective content libraries as the battle for streaming supremacy intensifies. Netflix, which started out as a DVD rental firm, was among the first to branch out into in-house produced content, a strategy quickly followed by Amazon and Hulu. Apple is late to the game, launching its first efforts — Planet of the Apps and Carpool Karaoke — on Apple Music last year. The tech giant has since expanded its original video operation with a slew of new hires and reported investments in multiple content offerings including serial comedies, documentaries, dramas and more.